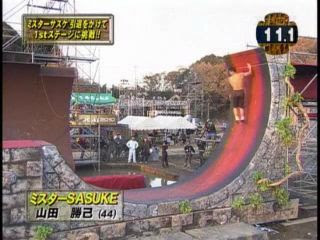 Sasuke spoilerific review ;) Warning.. incoming blog of Sasuke 24.. if you don’t want to know.. you have been warned :D For a preview of this event.. 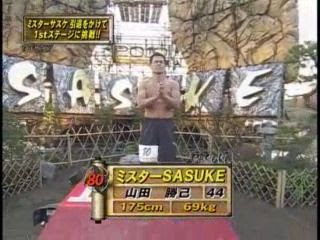 Please see SASUKE NAVI FALL 2010 (1 hour review of Sasuke 24 with fluff pieces of all the major players in the upcoming Sasuke!) 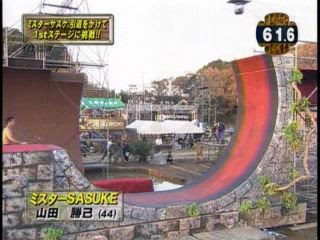 and the SASUKE PREVIEW SHOW that aired an hour before the official broadcast. Bare with me.. this show was 5 1/2 hour long (not including the specials..).. Geez I thought I was kidding about getting sick.. I'll have to slow down how I do this so bare with me! Oh.. and as Ube says: If you are from the G4 Forums, DON'T POST THIS THERE. They expect everyone to stick their head in the sand and pretend it doesn't exist.. Thanks guys for the correction on the box that shows up.. That's basically the "who's coming next". 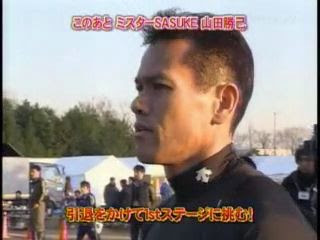 They are using titles rather than names in some cases .. for example.. Mr. Sasuke is coming up in the box (see the middle block). Whoot first shot up the wall! WOW awesome! 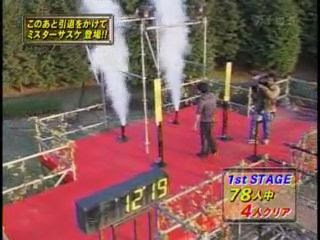 He's annihilated the first stage!! Wow a full 20 seconds left!!! 73 have gone and 3 have cleared!!! 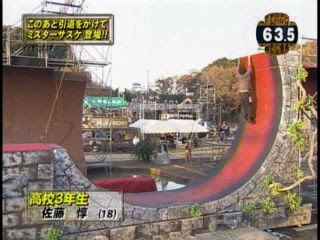 Reverse angle from the Slider Jump. I wonder if it's the same distance from 23? or further back like it was in 22? 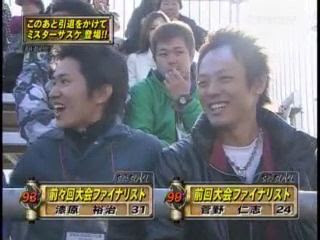 Fellow STQ'ers Yuuji Urushihara 漆原裕治 and Hitoshi Kanno 菅野仁志 are ecstatic that one of their own has passed again! 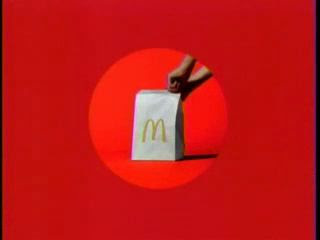 At least we don't get to hear the friggin' promoter/manager/whoever he was hawking their new C.D. MAN that was annoying during 23..
.. his fellow band-mate can care less.. wtf.. he's too busy making love to Sasuke Spray..
.. is that a girl? Mr. Sasuke seems interested... oh wait.. they are starting to bring up the countdown.. almost time for his run..
Doh.. almost identical to Ishimaru's run! "oh that is not good".. But first.. WHOOT Another STQ'er! 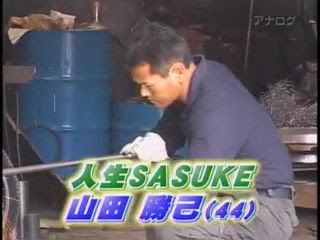 LOL he barely looks up as he's busy making love to Sasuke Spray. 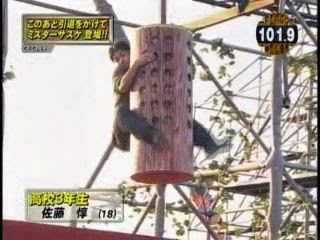 Dang he's pretty tall to make the Log Grip look that tiny.. 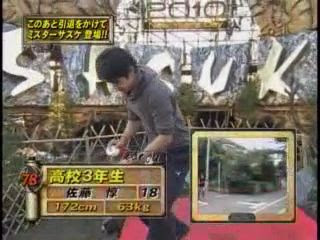 Hang on 172 cm.. he's only 5'6"? 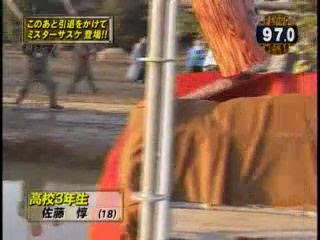 .. oh oh.. he's having problems.. he immediately got up and grabbed his shoulder.. Still makes the Jumping Spider though! First try up the wall!! Still plenty of time to get up the wall! 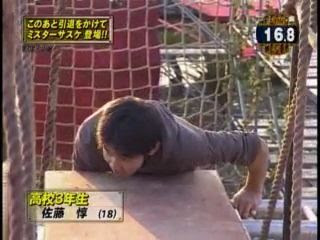 Struggling a bit to get up top..
Jun makes it with plenty of time to spare! 78 up and 4 clears now! Yep they are skipping #79 to bring you Katsumi's date with destiny - will he or won't he pass stage 1.. if he doesn't the threat of retirement is there.. again.. 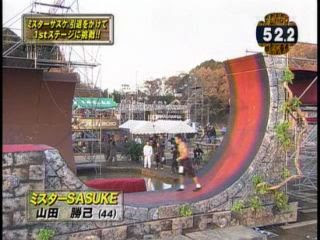 The All-Stars Gather to get ready for Katsumi's run while he gets acquainted with his old pal Sasuke Spray.. This is what he has been doing lately.. and no as funny as we like saying it.. it's not hotdogs.. he sells beer at baseball games. 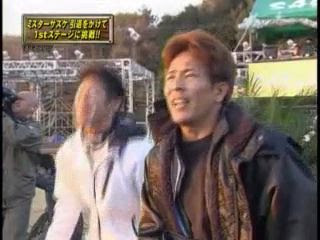 LOL It looks like Takeda is putting on surgical gloves in this picture with his hands blurred.. 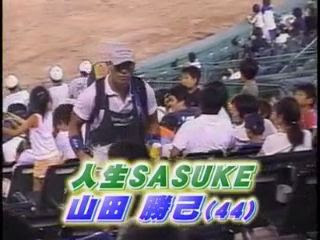 I swear someone wrote something on the Sasuke Spray.... seriously.. anyone can make out what is on it? it's usually covered completely in paper to cover up the brand name.. LMFAO is someone sent him Sasuke Spray for real... they Ube's idea if they did! LOL!! 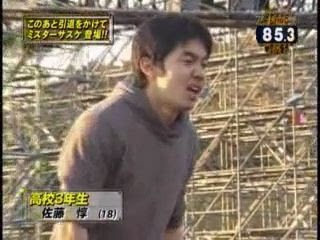 Wow.. Takeda is putting a lot of Oomph into this..
Yamada does a battle cry or is him yelling OOOOOOOOOOOWWWWWWWW? We will never know..
.. and TBS cracks out the chart of suckitude.. did I explain how evil TBS is? Seriously? DOH slipped on the 12 steps??? 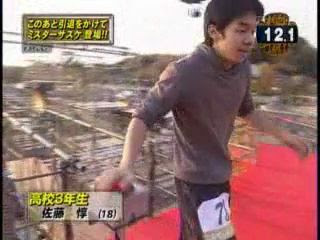 Katsumi Yamada 山田勝己 miraculously unscathed back at the starting line.. Okay he did pass the steps.. now he's staring at his old nemesis the Jumping Spider.. he takes a DEEEP breathe and takes his time setting up.. Nemesis #2.. 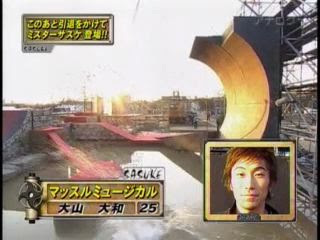 The &%$# warped wall..
And the now famous spoiler from the top of the show.. Takeda and Nagano freaking out..
And as he slides down..
Time is literally disappearing as he paces to get himself to decide if he's going to continue going for it. I'm convinced now this is entirely mental. 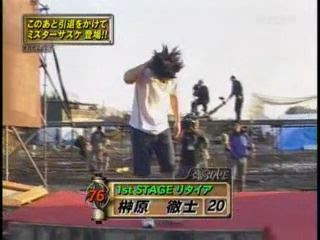 He can do this in his sleep..
Btw.. the announcer actually said "Arigato Mr. Sasuke Katsumi".. I guess in recompense for him being an a$$ to him in the previous tourney? 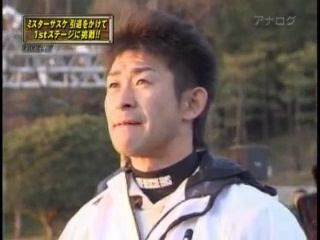 Nagano can't even come up with words or emotions. You can tell they knew it was going to happen. It's like watching in slow motion a movie you've seen 100 times. You know the ending already so it's hard to get all worked up one way or the other. .. he had it.. I knew it.. he had it..
And the final slide down.. that had to burn.... could also explain the marks on his back.. probably from his own Warped Wall at home. 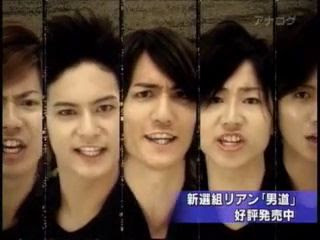 TBS is famous for these.. moments they like replaying over and over.. this will be one of them I'm sure. At least he did me the favor of not doing huge antics like he did before. He's quietly leaving without a fuss... just overcome by the emotion. The last image of Mr. Sasuke as a competitor - as least as TBS would want us to believe. Only time will tell for sure. I know he's become sort of silly over all these years, but still you have to be amazed by his passion... I really DO hope he'll quit after this attempt, for his own sake. Man, I'm sorry for him. 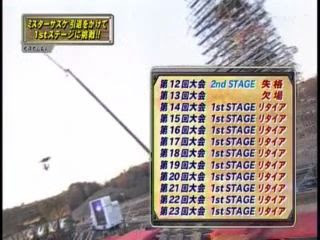 Even if I've never been a huge fan (He's behaved too cocky and did too much antics for me), I'm stil sad; I would have liked to see him pass the damn First Stage. He gave everything for Sasuke, and he shouldn't have. 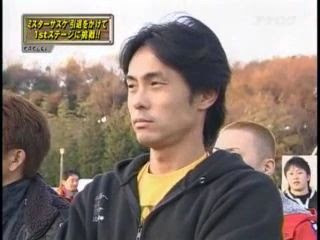 I hope not to see him begging to come back in Sasuke 25: that would be pathetic. P.S. Elsie, this was the quickest blogging speed I've ever seen! 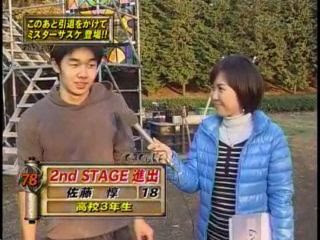 Hey Jelena welcome back :) I agree about the quitting part for Yamada. He's already lost so much. He lost the respect and support of his entire family (maybe not as much from his son from what I hear) where they don't even want to appear on camera with him anymore. He doesn't support his family with a stable job anymore.. and he basically forfeited 13 years of his life for glory on an game show.. really sad. 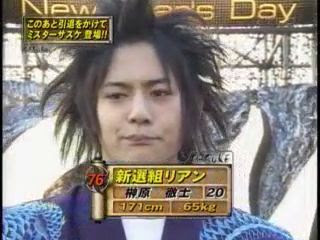 it may be offensive to Yamada's fans but IMHO this could be the best thing for Yamada. Get his Real Life back in order. 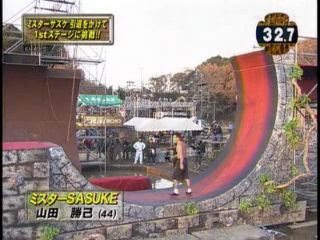 Actually i secretly hoped he set his life right first & then get back on sasuke as a dark-horse competitor. 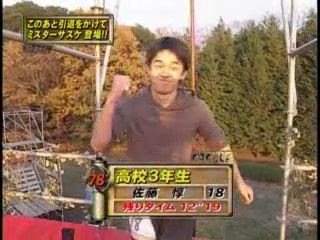 He should be a happy competitor, fail or succeed. 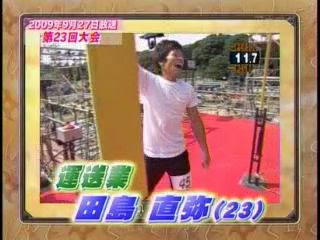 I felt bad for Yamada seeing him fail like that. That made me cry. I hope he does come back at some point. 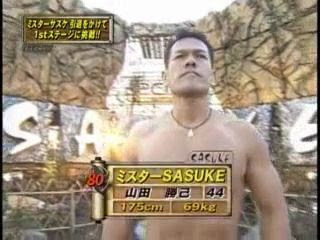 Even if he isn't in Sasuke 25, I hope he comes back for Sasuke 26. 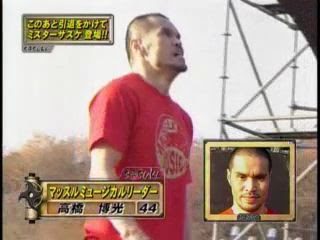 Btw, the yell he did when Takeda thumped him wasn't a yelp of pain. 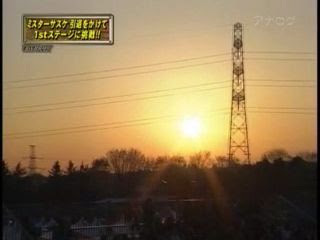 That was a "kiai" or "spirit shout." I do those all the time at martial arts tournaments. It impresses the judges and adds power to my strikes. It also helps me to be less nervous. 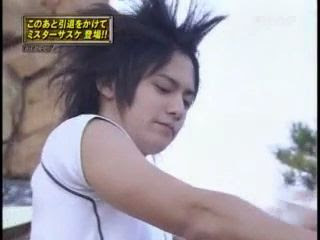 That's probably why Yamada did that, to boost his confidence and to help him relax. Deep breathing helps you relax, and a kiai is basically deep breathing with a yell added to it. Also, if you exhale right as you get hit, it makes the hit hurt less. That could've had something to do with it, too, considering how hard Takeda hits. Hey Awee I totally missed ya while I was putting up part 7 (Currently working on getting 8 out today before I got to bed.. lol). I do agree a lot with your assessment. I hope he can patch things up at home and start over. Just sad really. Who's to say that fans wouldn't get him out of retirement again. TBS would bow to that pressure after all this is about ratings after all and if they want to see someone they will bring him out. He's done a lot for TBS over the years for them to abandon him now. 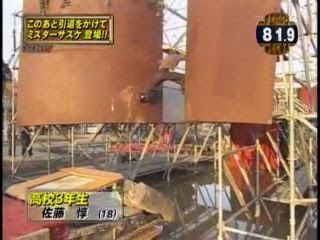 I don't know that Shingo would mess it up. 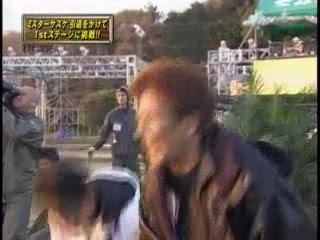 You mentioned Shingo holding his breath when Takeda was about to hit him. 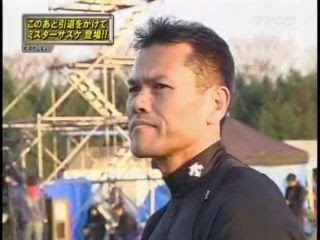 It may be that he was doing that so that he could exhale right as Takeda thumped him. I'm learning about the deep breathing stuff because I just learned a new kata, the sanchin kata. It's almost more of a meditation exercise than a kata. Sensei says it's really one of the most important kata, because you learn to throw a punch, to take a punch, and to breathe deeply. Because sanchin is a deep-breathing kata, it is the only empty-hand kata in Isshinryu that does not have a kiai in it. Sanchin is a relaxing kata anyway, so it doesn't really need one. The other kata have kiai in them. The kiai does help with confidence. 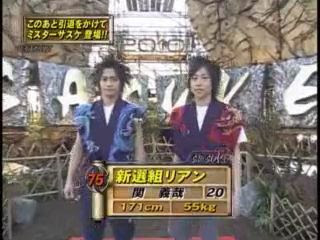 Actually, Takeda mentioned that once. Levi asked him and Nagano what they do to relax besides hitting each other. 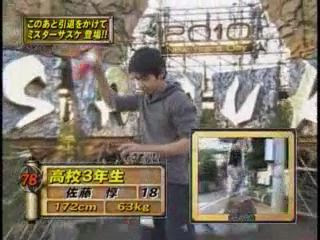 Takeda said "It depends. Sometimes we scream." The way that translated is funny, but he was talking about the kiai. He's right, that does help. 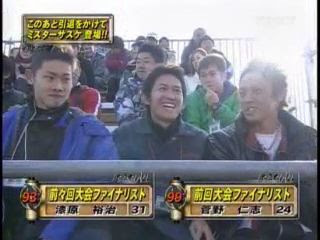 Shingo was clearly laughing through most of it so I doubt he was really concentrating which I thought was really cute and funny. 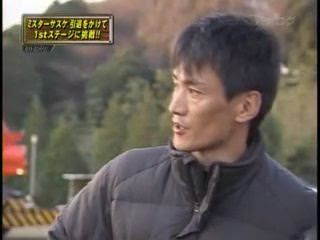 Never heard of him being into martial arts at all unlike Nagano who lived and breathed it until his adult life though that doesn't mean Shingo hasn't at least heard of it. 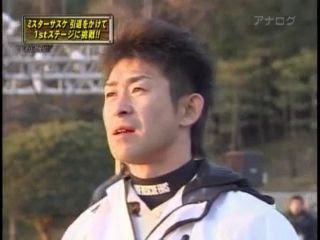 Shingo is a lone wolf in Sasuke who's associated with everyone simply because he's been there the longest. It's nice seeing them play with each other as they have lately. It's nice he has been able to take time to be with them outside of Sasuke so they can get to know each other better. I think it's benefited everyone seeing them get closer and better friends. Sorry I haven't commented on this one for a while. My computer is acting weird. I don't know if the All-Stars are still into martial arts, but most likely they've all done it at some point. 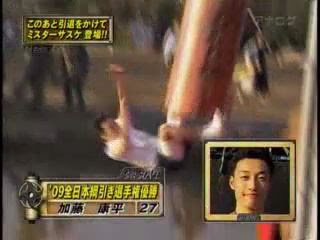 I read somewhere that in Japanese schools that's what they do for P.E. 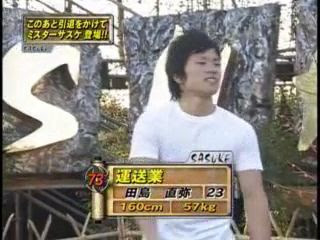 I dunno if Shingo continued doing martial arts after he finished school, but he probably did at least some basic karate or judo when he was in school. Not all Japanese schools are the same. 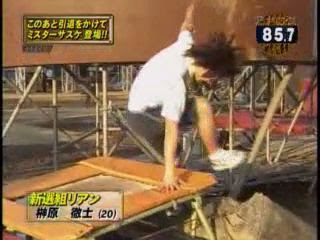 To my knowledge Shingo grew up in Tokyo or Tokyo area and was heavily in track and not martial arts. I understand what you are going at but I do not believe he has the background. Please remember that Nagano grew up in a different area of the country and was heavily influenced by what he saw on TV and did Martial arts on his own since he was a child emulating his heroes on television. He did not learn it in school. He was self taught as kids emulating things like Teenage Mutant Ninja Turtles did in your generation and Bruce Lee and Jackie Chan for mine. 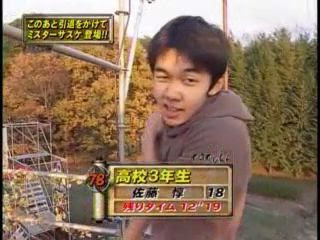 Bunpei also falls in this category where his life was heavily centered around track and not martial arts. Everyone around the world is exposed to martial arts but that doesn't make them a heavy student for it. 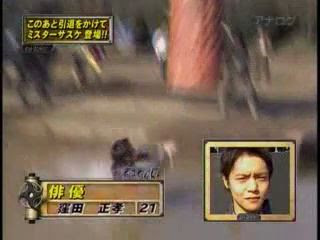 Nothing is wrong with not studying martial arts and I don't see why Shingo should be put or not put in that category. As far as the "caning ritual" as I call it .. that has always been a Nagano thing that Takeda embraced strongly due to their friendship. 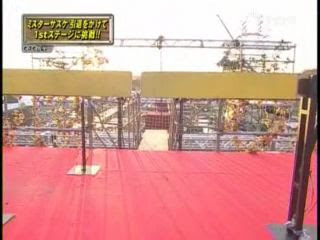 Since TBS caught on to it and kept showing it on air they made it sorta like a ritual that others emulated. 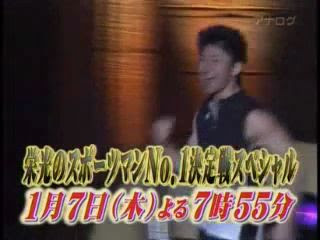 Shingo up to now has never participated in it and he was clearly uncomfortable with it. It's not everyone's cup of tea but it's cute how all the All-Stars banded together as one team when we all know by now that they are put together by the television show and don't keep up with each other unless it's event related. Nothing wrong with that either. Considering they managed to stay together as long as they have being an artificially fused group.. it's nice to see they all get along in some measure over the span of time.